Regenon is a product that affects the hunger center of the brain. A diet product that has dramatic effects with a minimum of side effects, like for example Reductil (Sibutramine) or Adipex retard. Losing weight will be as easy as pie, as you do not even have to fast or keep a very strict diet, if you decide to take this weight loss product. It can be recommended to all those who tried to get rid of overweight before and did not succeed. - It decreases hunger significantly, covers the stomach with an oily film, thus granting the feeling of satiety for several hours. - Detoxifies the body, cleaning it from bulk. - It concretely increases the calorie consumption of the body, and burns fat mass apart from this. - It has a moderate diuretic effect. Whom do we recommend to take Regenon capsules? During a diet it requires tremendous will power to suppress hunger. Low insulin levels, caused by the lack of carbohydrates, turns the life of someone, who wants to lose weight, to hell. In order to make suffering less terrible, you can choose from several hunger reduction products with different mechanisms of action. The most popular of which are the diet products Regenon and Adipex retard. The use of this product is more common under women – due to hormonal reasons they are more exposed to "snacking", and in addition the fat burning effect of testosterone is weaker in their case. Regenon affects the central nervous system. This leads to decreased hunger in the brain, and it has also effects in other parts of the organism, like fat tissues, where the fat-burning effect of the diet drug shows up. Regenon is a unisex product, so it can be taken by men and women alike. It has been developed for people whose overweight is so huge that, due to serious health risks, they have to lose weight as quickly as possible. According to the leaflet, it can be recommended to those who suffer from self-assessment problems and to those whose BMI is 30 or higher. Body Mass Index = BMI is the most commonly used international ratio to measure physical condition. The BMI calculator helps defining your physical state – whether you are too slim, have a normal build or are obese. The BMI table is at this moment the most reliable calculation used by nutrition professionals. That is, let's say you are 167 cm tall, that makes 1,67 meters. Now take the second power of your body height (1,67 x 1,67 = 2,79), and then divide your body weight with this number. Eg. : 55 (kg) : 2,79 = 19,71 BMI. That means that you are not obese and do not need any diet products! With age, the interpretation of BMI changes somewhat, which means that higher values can be regarded as normal. Over the age of 50 for example a BMI level of 27 can be still regarded as normal build. It is similar in case of sportsmen (bodybuilders, leading sportsmen). Because of their muscle mass the body mass index is a bit different from average. The active substance of Regenon is Amfepramone. "Amfepramone is a stimulant drug of the phenethylamine, amphetamine, and cathinone classes that is used as an appetite suppressant. It is used in the short-term management of obesity, along with dietary and lifestyle changes. Amfepramone is most closely chemically related to the antidepressant and smoking cessation aid bupropion (previously called amfebutamone), which has also been developed as a weight-loss medicine when in a combination product with naltrexone." 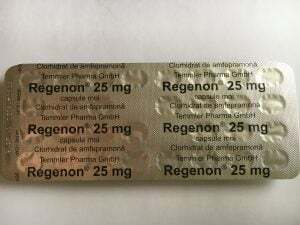 Regenon contains 25 mg Amfepramon per capsule. The structure of the fat-burning diet drug Regenon is very similar to that of Adipex retard. Both of them are used to decrease body weight / fat, and it has a respective effect on the body of those using it. 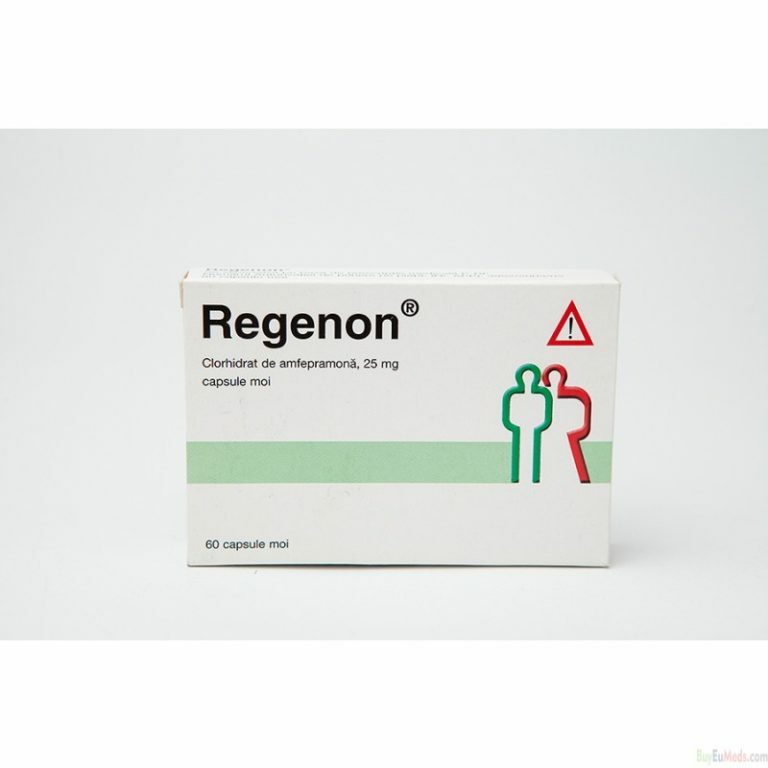 In addition to the original Regenon, which contains 25 milligram of amfepramone, the pharmaceutical company producing it, Temmler Pharma also created Regenon retard, a new version of the product with 60 milligram of the active substance amfepramone. It is sufficient to take 1 Regenon retard pill per day. However, critics state that, in terms of efficiency, the 60 milligram capsules do not even come close to the 25 mg version of the appetite suppressant that can be taken three times a day. 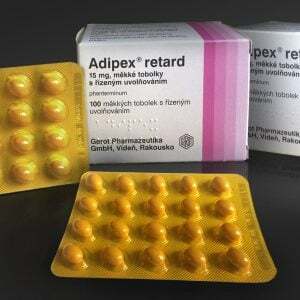 The word retard means that the active substance gets absorbed gradually, slower, which in return caused stronger side effects in case of many users. It depends on the organism which kind of Regenon turns out to be the right one, but most people prefer the 25 milligram Regenon that can be taken three times a day. General opinion of consumers is usually much more than "satisfied". According to their description, they felt happy, fatigueless and strongly active during the cure. It is one of the most secure drugs of its kind, as it does not have severe side effects – like the diet products that were available before. Regenon capsule is the newest diet product of our time that does not have liver or kidney harming side effects. It has a fat burning effect, is a light diuretic, appetite suppressant, and in addition detoxificating – and so it became one of the most acclaimed diet products in pharmacies. Experience shows that with the use of this diet product you can even lose up to 5-15% of your body weight in the first four weeks of the diet. The ratio of weight loss depends on a number of factors, but we can in general state that consumers around 75 kg can lose around 8 kg in four weeks, while those over 100 kg can get rid of around 10-12 kg. During the second and the third month the amount of lost kilos gets smaller. This is a something completely normal, as the body needs to burn less calories per day by that time. It needs to be noted that losing weigh too quickly is just not healthy. It puts heavy load to the heart! Should you lose more than 3 kg per week with Regenon, then please reduce the dose or cease taking the product for a while. An ideal pace would be losing not more than 1-2 kg per week – that way you could be sure that losing weight too quickly would harm your health. It cannot be recommended to use Regenon to those with liver, kidney or brain disorders. Regenon has to be taken as a cure. The length of an efficient cure is between 8-12 weeks. It is not purposeful to use it for more than 12 weeks. It is recommended to keep a break of about 4-8 weeks between two cures. Please always ask your doctor for advice before using Regenon. Do not use Regenon if YOU ARE NOT obese! The dosage recommended by the producer is one 25 mg Regenon pill per every 30 kg of body weight. So, if you weigh 60 kg, you have to take 2 capsules per day. The usual dosage is 3 x 1 capsule daily, taken 30 minutes before meals. Please take the capsules only with water. Should you take it with alcoholic drinks, milk or other beverages, the absorption rate of the drug might decrease significantly. Never take the whole daily dosage all at once. Always divide it into even portions. E.g. morning, mid-day, evening. Just like in case of any other drug, the efficiency of Regenon gets weaker with time as well. It has the very simple reason, that the organism gets used to the product if used on a daily basis. This timespan varies from person to person. If it happens, you can feel that the rate of weight loss slows down, and you get less out of the positive effects of Regenon. Should that be the case, it is recommended to hold a break and go on with the cure later. During the usage of Regenon it is important to drink as much water as possible. Drink at least 2,5-3 liters of mineral water per day. This helps removing the excreta from the body and you will not get dehydrated. When taking the capsules, you have to follow the instructions and dosage described in the leaflet, just like in case of any other drugs. Do not risk an overdose with amfepramone. The leaflet deals with the timing of the diet in detail. In order to reach the strongest possible effect, you have to take a break of 14-28 days after the third month – only then can the next cure begin. If you do so, you will avoid an overdose and your body will not get used to the active substance. If you forgot to take Regenon before your meal, do not make up for it with taking a double portion afterwards. From all available weight loss drugs, taking Regenon bears the smallest risk of side effects. This means that critical symptoms can only occur in extreme cases, as distinct from other diet products. One of the most common side effects mentioned by users is never-ending thirst. As we already mentioned before, drinking enough is extremely important (and this should be quality mineral water!). Should the side effect symptoms get stronger during the cure, you should take a break in taking the product. It is recommended to consult your doctor in order to disclose any health related problems. It is possible to take it together with different medicaments, if the consumer follows all instructions. You are free to use pain killers during the cure that can be bought without prescription, although Regenon might lead to irregular heartbeat if taken together with some painkillers. Therefore you should by all means consult your doctor, if you take painkillers on a regular basis. The most essential base material of Regenon, amfepramone might alter the insulin dose of diabetes patients. Therefore it is recommended that you calibrate your insulin dosage with your doctor. Regenon is a strong, weight loss enabling product that might block the action of some antihypertensive drugs (alfametildopa, gaunetidina). So, should you take antihypertensive medicine on a regular basis, please consult your doctor first. The effect of the product is similar to the mechanism of action of the diet drugs Adipex retard or Sibutramine. As a reaction to the active substance the body starts to accelerate burning carbohydrates. In addition, it suppresses appetite and increases the pulse. Thanks to the higher pulse metabolism gets accelerated as well. As a result, the body parts that are the most likely to take on fat – belly, thighs, waist – begin to change first. There will be a significant change in sizes in the first 2-3 weeks. The clothing size of the individual can change by a whole size after the 4th week. Several users reported, that, while taking Regenon, the body might react frequently with headache after a meal rich in calories, breaking the diet patient of the habit of snacking. One of the biggest advantages of Regenon is, that the lost kilos will not come back after the cure is over. After the diet is over, the body got so used to the new dietary and the outbalanced lifestyle, that the lost pounds will not come back. The ideal figure you attain with the help of the fat burning medicament can be preserved, if the user took on a new lifestyle. Overweight can be banned for good if you take Regenon, you just have to keep in mind, that you should not eat more calories after the cure than you necessarily need. It would not be hard to do the exercise if you support your balanced dietary with three times sports per week. Using weight loss drugs can most of the time only be recommended in case of severe obesity, over a BMI of 30. But it is important to note that no capsule ever replace a healthy lifestyle. According to professionals a slimming cure is the most effective if you do sports and a diet in addition to taking medication. It makes no sense to take diet pills, and eat crap food the whole day long (pizza, white bread, pasta, cookies). Doing more exercises does not mean that you should do the hardest training immediately. In the beginning it is enough to go for a 15-20 minutes' walk before going to bed. In our cool article we summed up for you how you can do a successful diet. Please find further information here. It is not recommended for pregnant women, as it might be dangerous to the fetus. Neither is it recommended during the breast-feeding period, as the active substance accelerating the metabolism, amfepramone, might get into breast-milk. 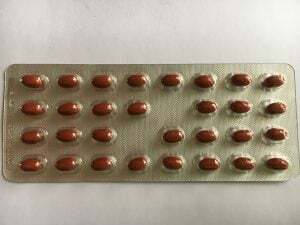 A sheet contains 30 capsules, a portion of about 10 days. 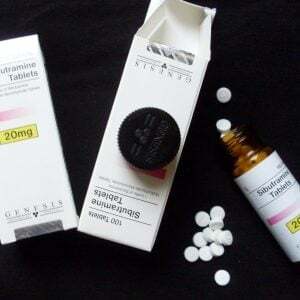 It contains 25mg amfepramone per capsule. You can see the code of the company, production number and expiry date on the blister. Expired medicaments will not harm your health, it only might have less active substances left. 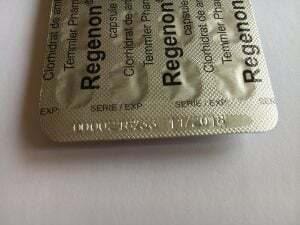 However, do not start to take a package of Regenon that is already expired. The producer of this weight loss product is Temmler Pharma GmbH& Co. K.G., with seat in Germany. Regenon gets also produced in Denmark and Romania, the products are popular throughout Europe. Getting the product prescribed is quite complicated, so most users rather order Regenon via reliable online webshops. Many users choose the domestic or foreign websites of pharmacies, where it can be ordered. It changes from country to country, but a blister with 30 capsules costs about 40-50 euros, if you have a prescription. Without prescription the price might be double. At our webshop you can order Regenon on the lowest possible price. Fake Regenon, how do I realize it? Counterfeit products look more and more like the original ones. Sometimes even professionals do hard in identifying the copycats coming from illegal sources. Regenon is no exception. Any kind of medicaments produced or stored under unprofessional, uncontrolled circumstances are dangerous. - The medicament contains more active substances than specified, so it might cause side effects that can lead to irreversible damages, or even become lethal. -The product contains poisonous substances, as a result of wrongly chosen active substances and excipients, unprofessional production processes, expiry, or inappropriate storage - it might cause severe health damages. Fake medicaments are most of the time cheaper than the originals – but that is not true in every case. If a medicament has no effect at all, you will recognize it in not more than 2-3 weeks, as you do not lose a gram of overweight. The best solution to control that is a diary – you should write down your dietary, the changes in body weight from week to week. You will be able to fully oversee it from a one-month distance and look back at it. We would suggest that you did not weigh yourself every day – instead choose a day every week, e.g. Mondays, and use the same scale every time. Amfepramone has to cause weight loss in just 2-3 weeks. You should be able to see that at the scale as well. If the scale does not move at all after the 2-3 weeks period, you most likely got a copycat then – but it might also happen that your body does not react to the active substance, the feasibility of which is very small. You should not worry about the origin and inefficiency of the product after a few days, as your organism needs at least 1-2 weeks before it gets used to the calorie deficit and weight loss. However, should you still not get any result after 2-3 weeks, you most likely have run into a copycat product. I also tried sibutramine and regenon. Regenon is far far better! (for me) NO SIDE EFFECT! My appetite disappeared. Lost 11kg. First time I finally waiting for the summer. My confidence returned. Thanks Alex for your great support. Fiorella from Milan. I have had no problems at all with taking regenon. After 3 weeks I lost 5kg. Best support to Alex. Then I tried Sibutramine and Adipex retard but as a customer already said Regenon is the best product for losing weight. No side effects. I have enjoyed a great result losing almost 12 kg over the last 4 months. Super! Schneller Versand, Medikament hält was es verspricht. Bin sehr zufrieden. Ein Produkt das hält was es verspricht. – da es öfter nicht lieferbar ist werde ich als Alternative jetzt mal Adipex versuchen und meine Erfahrungen danach berichten. I am having good results with Regenon. I have lost about 31 pounds in 6 months. I’m not doing any hard diet, BUT I’m only drinking water. No cola, sodas, juice or sweet tea. All in all, I recommend Regenon. Excellent product. I’m satisfied with Regenon. After two weeks I lost 3kg. I waited almost 4 months before deciding to write a review of this product. I have been using Regenon of 14 weeks with low calorie diet. I went from 124kg to 101,5 kg losing 22,5 kg!!! Love it and would highly suggest this product.